Ever since I have become a traveler, I am always game for new experiences. It helps me grow my perspective and ofcourse bring lovely stories for my readers and followers. 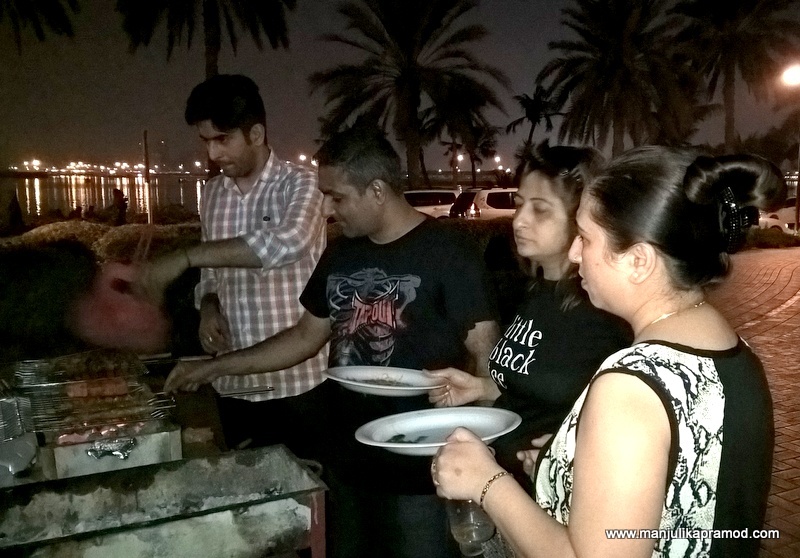 When I got a chance to join in a fantastico beach and barbecue picnic at one of the hidden gems of Dubai, I was all in for it. 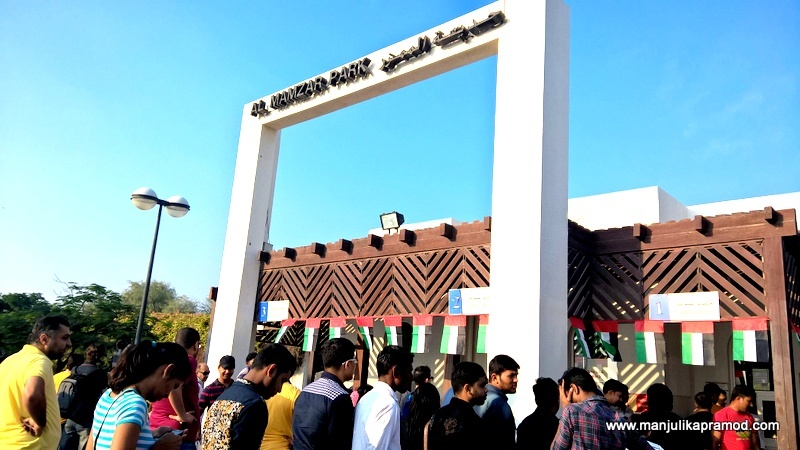 Here is all about my experience at Al Mamzar Beach Park with my Indian gang. I would also say there is nothing like gathering friends and family for a sunny, beach picnic or a garden party. 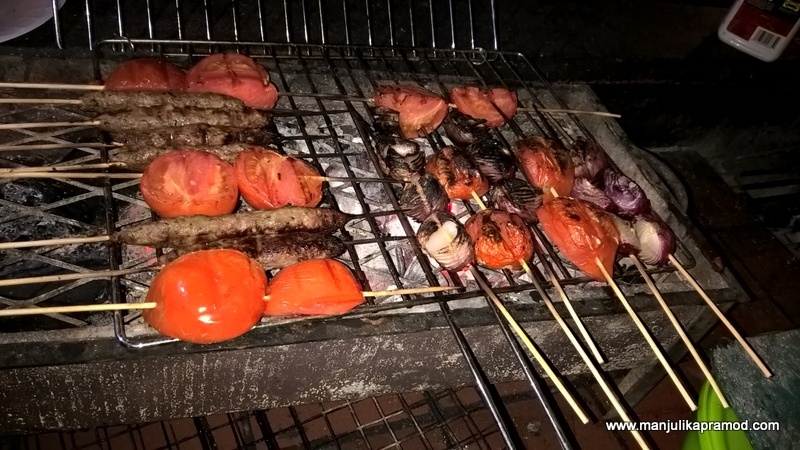 Wikipedia says food that is flavored through indirect heating and by smoking process is called Barbecue (also barbeque, BBQ and barby/barbies). The method of cooking and the apparatus, both share a common name. 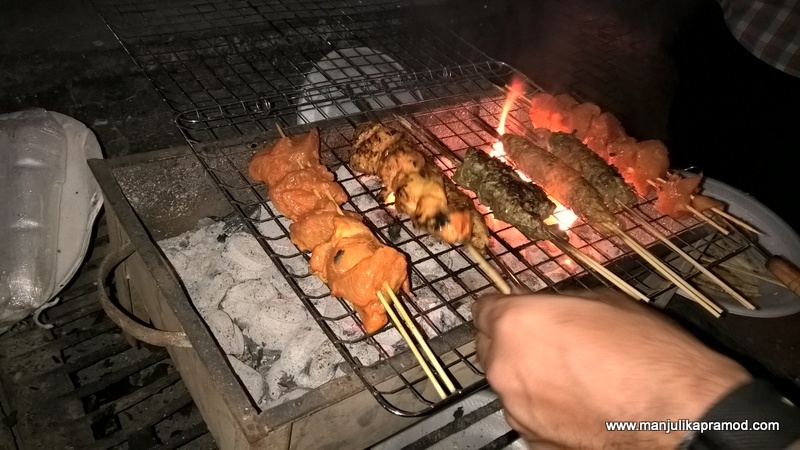 Of course, I knew all of that but I had never actually done a real barbecue until last month in Dubai. 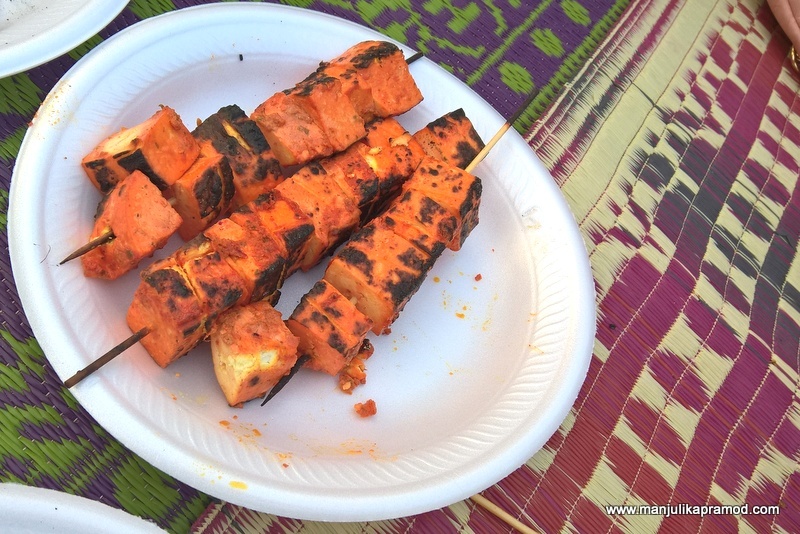 So what was your first barbecue picnic like? 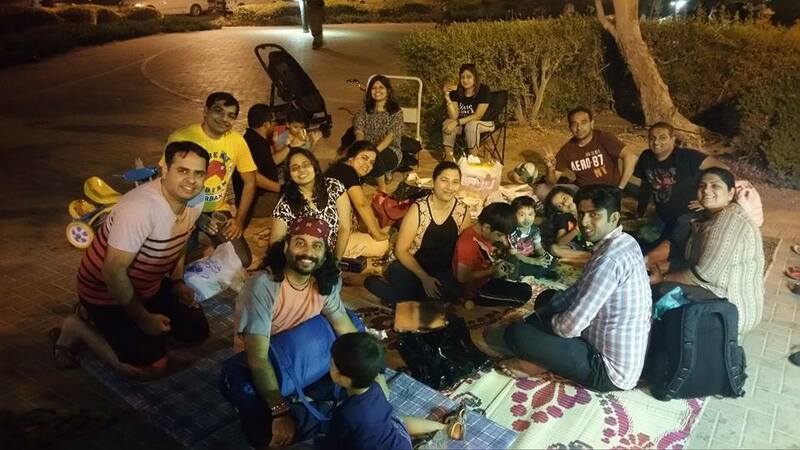 I had a great time with a group of Indian friends at Al Mamzar Park. And this experience could never have happened without them. 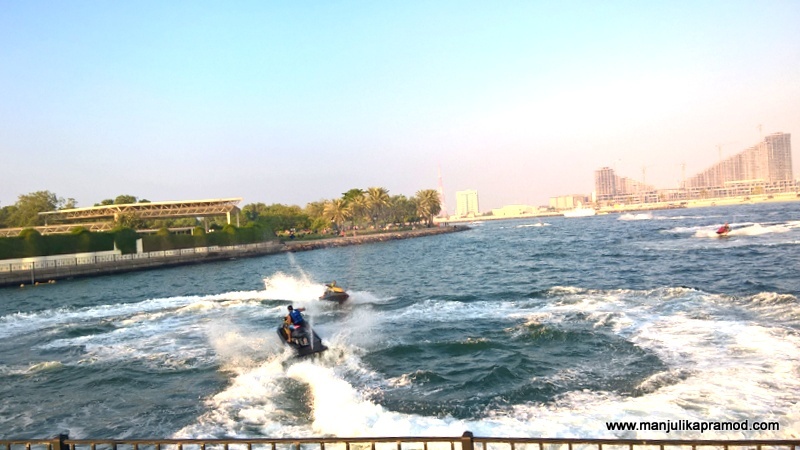 Next time when you are in Dubai, you must go exploring around this place which has beaches, playground, cabin rentals, swimming pools, green parks, lawns and barbecue areas. 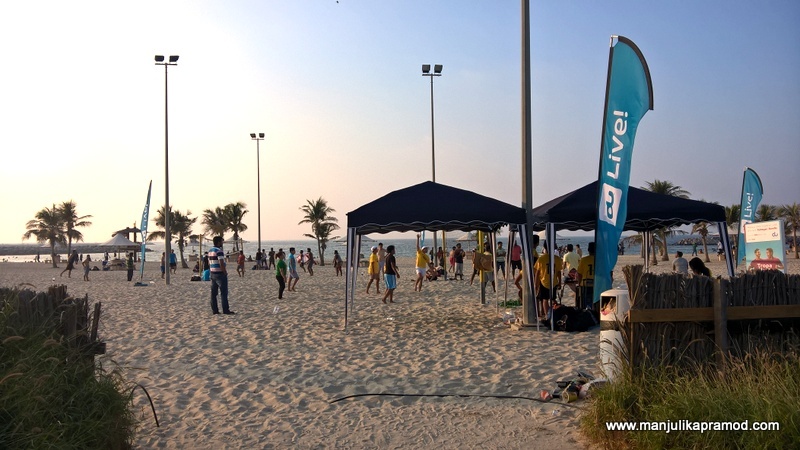 The entry ticket costs AED 5 per person and AED 30 per car. And I was surprised to see the queue. In fact before coming here, I had no clue about this place. My friends Amit and Neha and their gang of friends had planned this barbecue fun and I was in Dubai just at the right time to win an invite as well. I was excited about it all the more because this was going to be my first barbecue picnic. 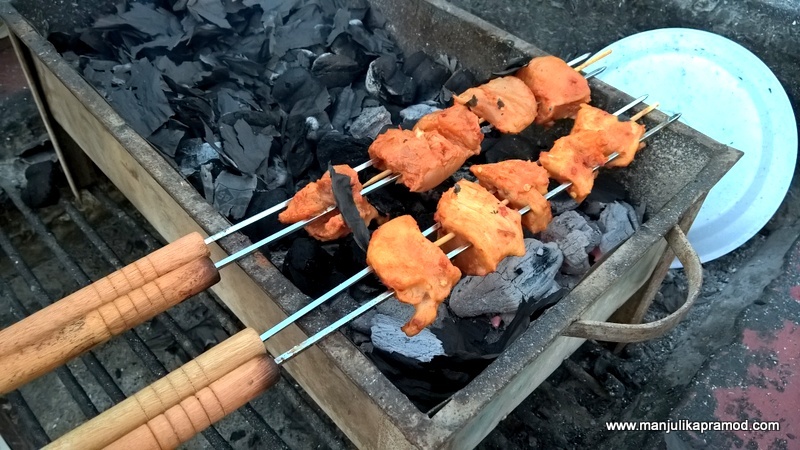 In fact we own a compact barbecue table which my husband had brought from Phillipines but we have never had a chance to use it in India yet. Reaching here was easy for us because we were on cars but otherwise its difficult to find a shuttle. There is no metro station at a walking distance and thus I would suggest the rental car for the place. Later, I found a helpful way for others. 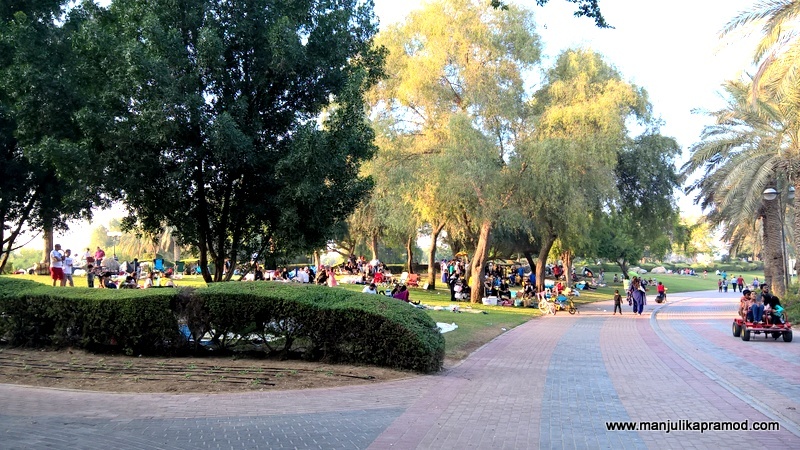 Mamzar Park is located at the Deira side of the Creek. So hop on the Green Metro Line to Salah Al Din station near Reef Mall. C28 bus runs from the East exit and takes you this park. Monday and Wednesday are ladies day. Once I was inside, I was taken in for a surprise. This place has sprawling greens and makes for a perfect getaway to spend on the beach. November was the best weather to be here. The sun was shining and it was breezy at 3 in the afternoon. I thought we were here just at the right time but no it was hugely crowded. In fact later I learnt that a friend had been keeping a place for us since morning. It was a Friday and on weekends it can be really tough to find a parking place and then a good place for the barbecue. We didn’t have anything to worry about. As our gang walked towards our arena, I was getting extremely curious around this place. It had amazing cultivated greens and traditional small spaces like above. I could see the beach in the far too. People were enjoying water sports at this side of the beach. While walking I came across the manicured lawns, lines of bristling palm trees, wide foot and bike paths, swimming pools and a activity areas for the kiddies. 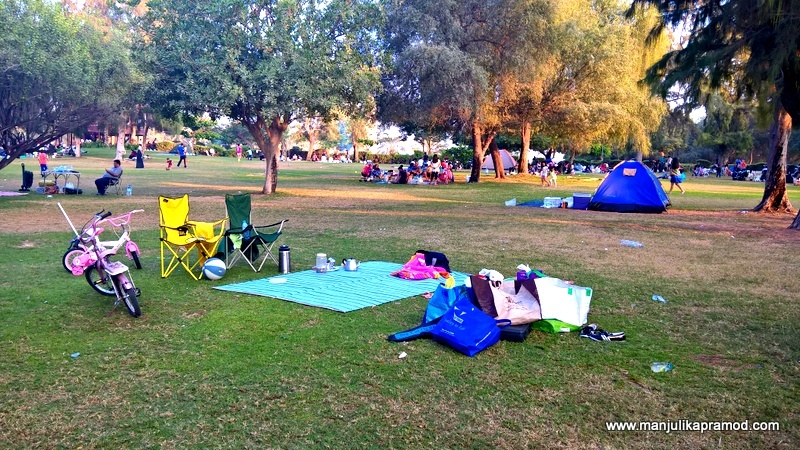 Either you just take your picnic stuff and spread it out or you can also book a chalet. It has a toilet, and a small kitchen with a sink and fridge, a sofa and seats. People do book it for special occasion or all day fun. 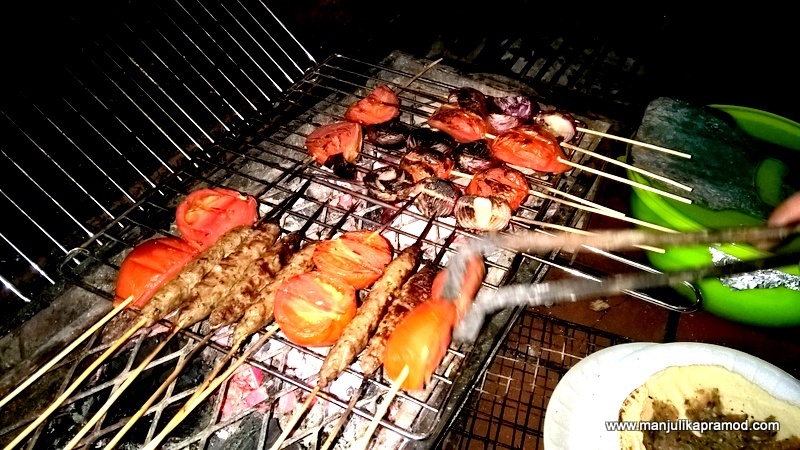 Once we had settled down and set up our barbeque station, I immediately took leave and went walking around. Since this was a known place for the others, they were not as curious as me. But the kids in the gang were looking forward to excitement and fun. I was glad to see them run around, off from the gadgets and gizmos. As I walked, I noticed that this was the ultimate destination for children. They were nice playgrounds and even skating arenas for kids On the beaches, I could see people swimming, sunbathing and playing on the beach. The sand was white and the sea looked warm because it was 4 in the afternoon. Everyone seemed to be enjoying their day. Overall, it has four beaches. I stood for sometime and watched the kids have fun. 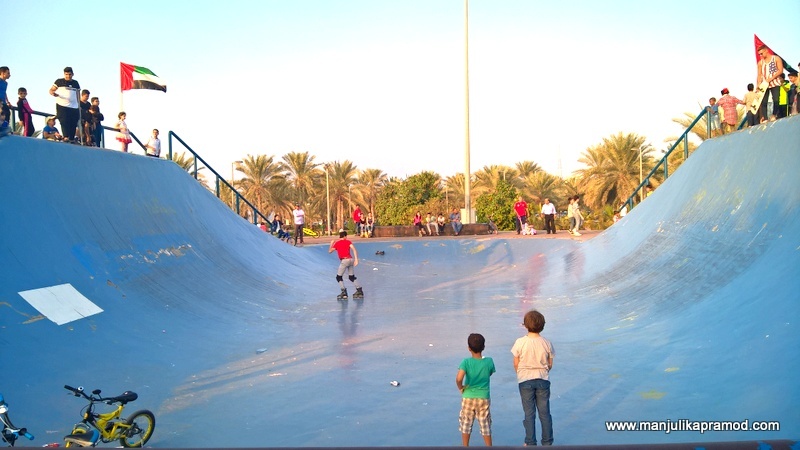 The one in the red t-shirt was a pro with his skates and I could see he was having a fantastico time. I had begun to enjoy my stroll all the more and I was glad that I chose to do this before eating like a pig. Suddenly I found myself turn to the area that seemed like a favorite spot. It was crowded with people and there was no space at all. Either people were eating or setting up the barbecue. Everyone was chilling out or having fun with family and friends. And no less it made for an outing for the whole day. 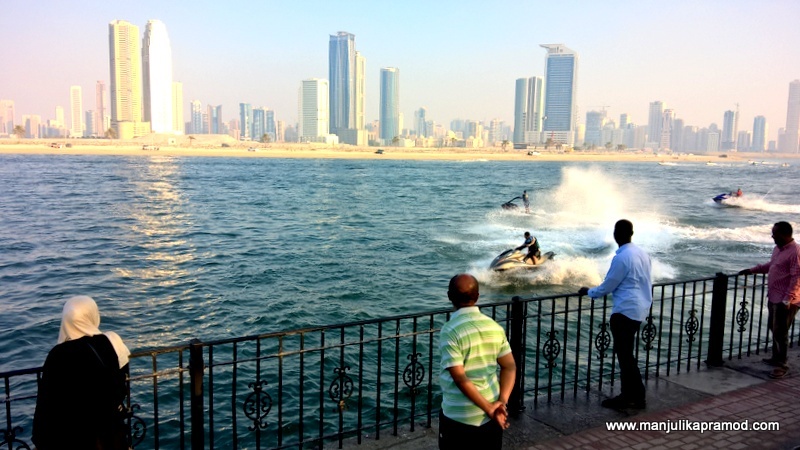 Jetskis & water sports grabbed my attention as I came across this section of the park. I stopped for some time to soak in the amazing sea-views and excellent sea-activities. 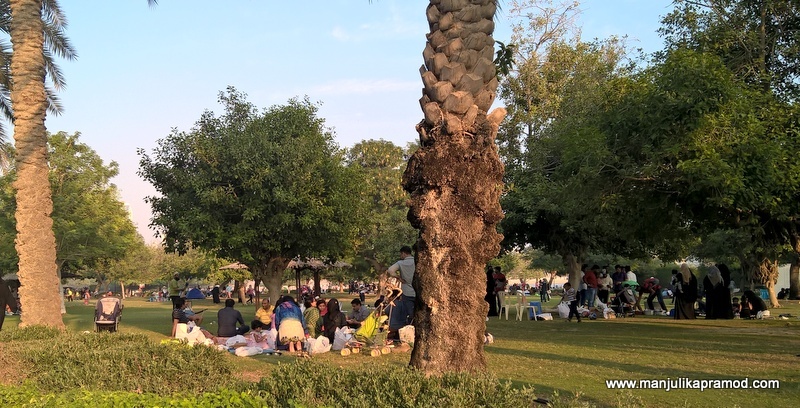 Al Mamzar Park is spread over an area of 106 hectares and yet picnicking facilities are available, on a first-come first-serve basis. Along with lovely BBQ areas, I was happy to see plenty of waste bins and people were using them too. There were fines were littering. However, I visited one of the toilets and found it unclean. The facilities were sufficient but for the mess and the unhygienic way of usage, it is the people who are to be blamed. It was surprising too because everything is so immaculate about Dubai. Once I had covered a major portion of the park on foot, I got a call from my husband to join them as they had already begun their first round of eating. I had come a long distance from where I had started. It had already been an hour since I left them to the grilling and barbecuing fun. When I heard of food, I decided to return because all this while, I had been tempted to what others were eating. 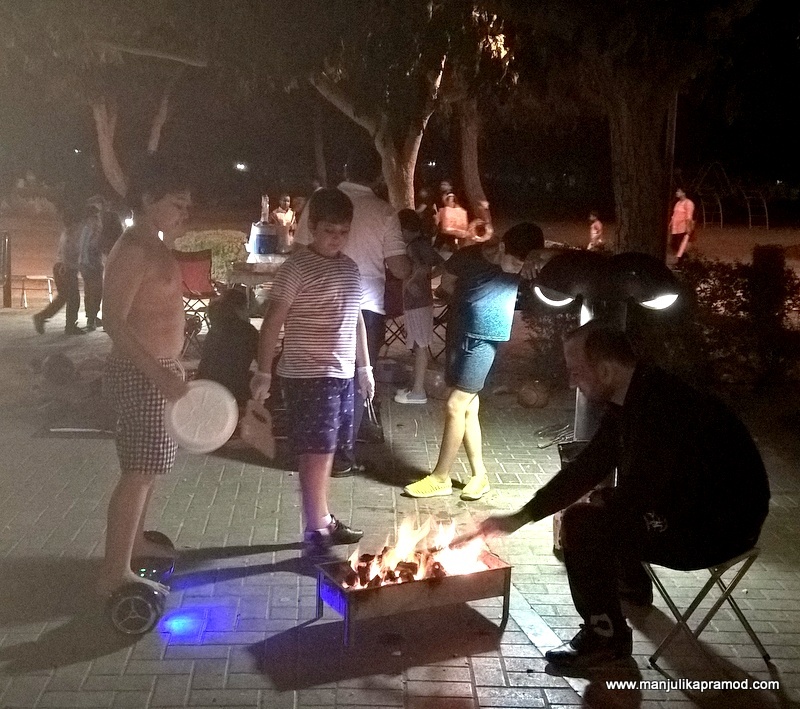 It is difficult to control when at every corner where you eyes take you, you discover barbecued food And later I learnt that Al Mamzar park has 25 barbecue areas with grills, tables, and chairs. I was back in fifteen minutes. Yes, I had been watching my path to keep track of the way. One of our friends had told me that its easy to lose way in the park because its huge. 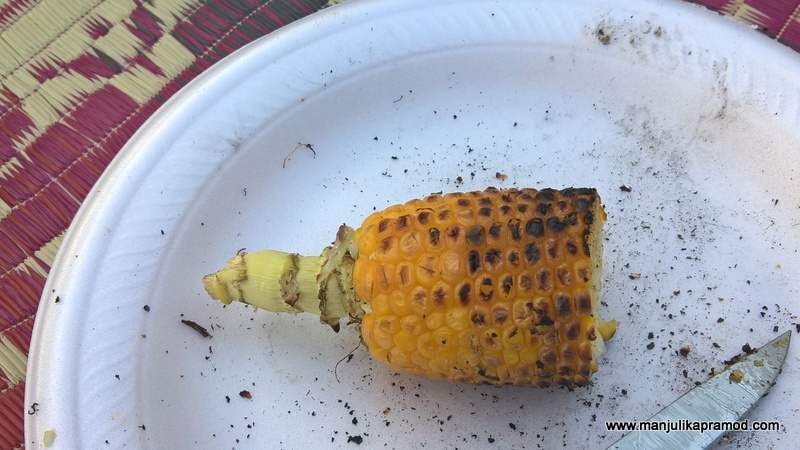 Thank God, I made in time and grabbed this last piece of corn. It tasted yummy. Doesn’t it look yum too? Some skewed chicken! Who wouldn’t love it? Good food is my weakness. 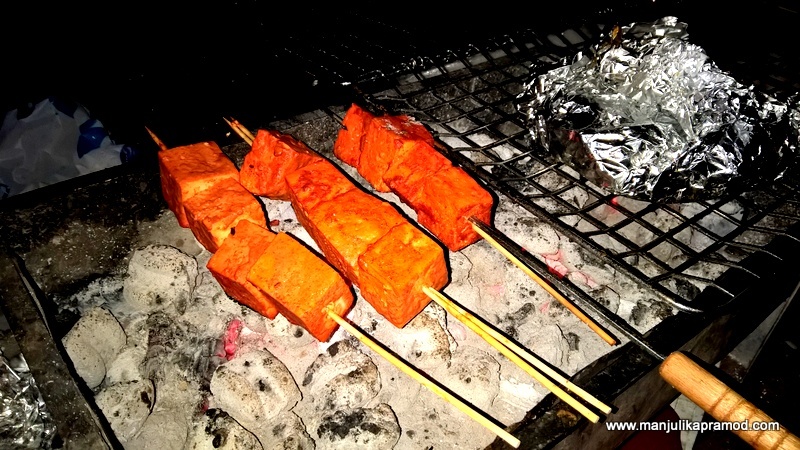 There were lot of vegetarian people in our gang and they were having a great time over luscious, spiced, grilled cubes of Paneer. We did some more marination preparation (above) while the potatoes were being barbecued (below). Trust me, the veggie friends had more variety and options to cook . 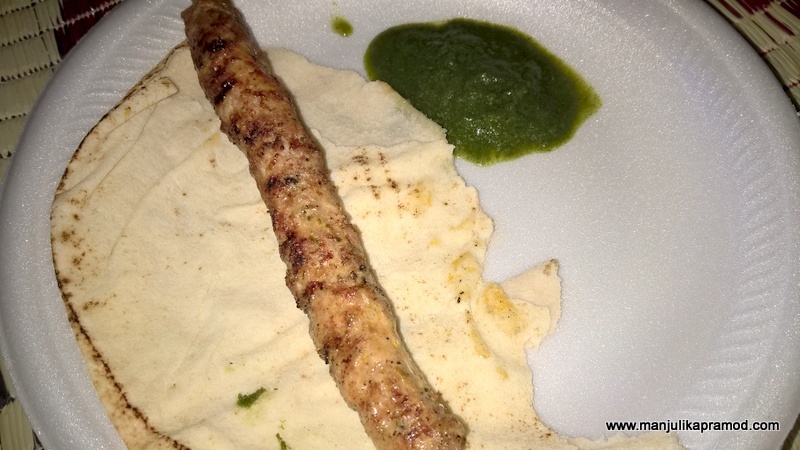 We only had chicken chunks and minced meat ( seekh kebabs). I took a break from eating and went ahead to capture sunset. 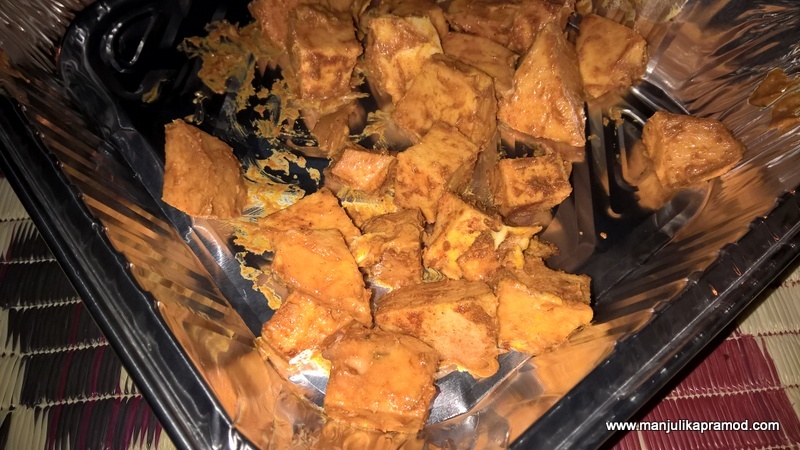 This is marinated yam. We barbecued it in a foil paper tray and it came out to be super yum. 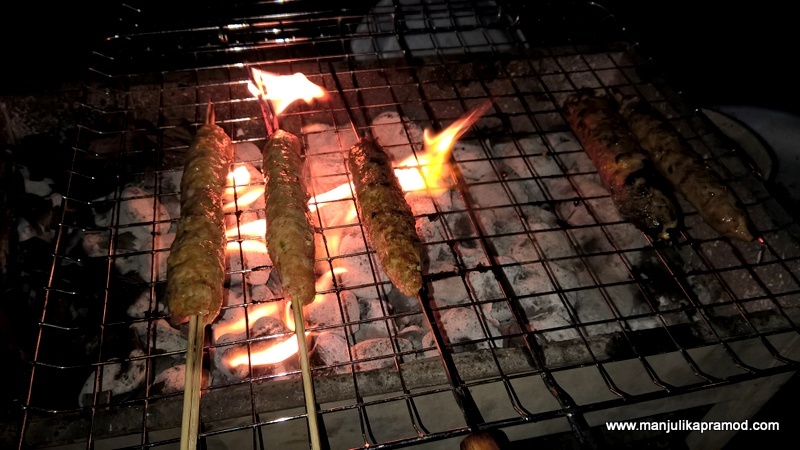 The seekh kebabs. I was greedily hungry. This was not our barbecue station but of our neighbors. They had tomatoes and onions too. 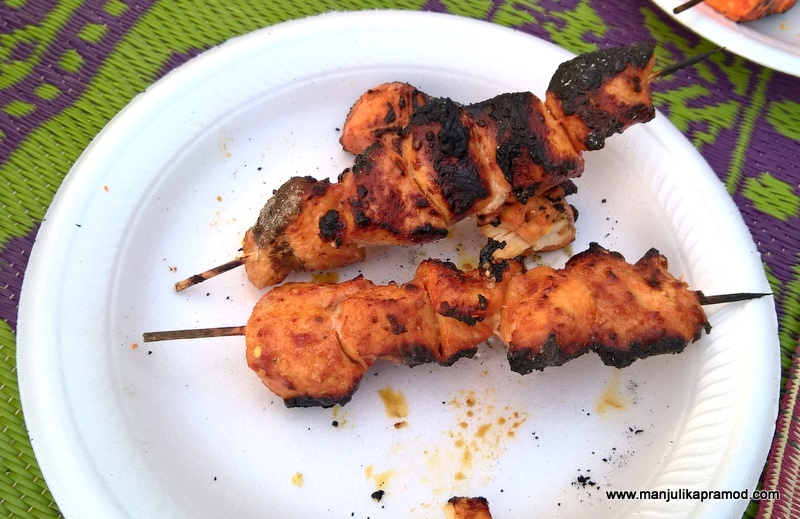 So next time when you go for a barbecue, pack these too and have great fun. Some more cubes of paneer! The party went on. We were a gang of 8 families so now you know how much we ate. It was indeed a Barbecue day!! Did I tell you, it was a ladies no cooking day? Well, the men did all the grilling and smoking and we just ate. Our job was to grab a plate, eat and appreciate for all their efforts. The last roll for the day. I was full. While we had packed up and were making our way out, I saw these kids having a great segway time while their Dad cooked. They had not been able to grab a barbecue station but they were doing great in their way. There is space for everyone at Al Mamzar, you just need to grab a spot for yourself. And now the best picture of the day. I must say a THANK YOU to this my Indian gang. Dubai is a home away from home for all of them. This fantastico experience wouldn’t have happened without them.